What lies beyond the western shores of Midgard, past the boundaries of civilization and into uncharted waters? If you believe the old sea legends, brave explorers will find mysterious islands full of beauty and horror, and rich treasure guarded by unknown gods. Some say that out there among the waves, a sea-king lies in chains; and a goddess of memory and time weaves dark intrigues that reach everywhere - even deep into the lands we know. 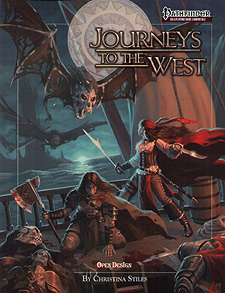 Sail beyond the horizon and into undiscovered realms with Journeys to the West.